The Wild West is such a fun theme to work with and the kids really seem to enjoy it. I would like one of them 10 gallon hats myself to wear around. I could so see me in a pink cowboy hat. It would look perfect with my flip flops. Anyway, this is a 13 page educational pack download with 11 worksheets that focus on beginning math concepts such as counting, patterns, and basic addition for examples. The theme, as you can see, is the wild west. I used the cowgirls from my latest clip art set to create this educational preschool math pack as well as a few new pieces from a western set I am working on. Also included as a bonus is a printable Sheriff’s Badge that says Honorary Sheriff and they can write their name on it. 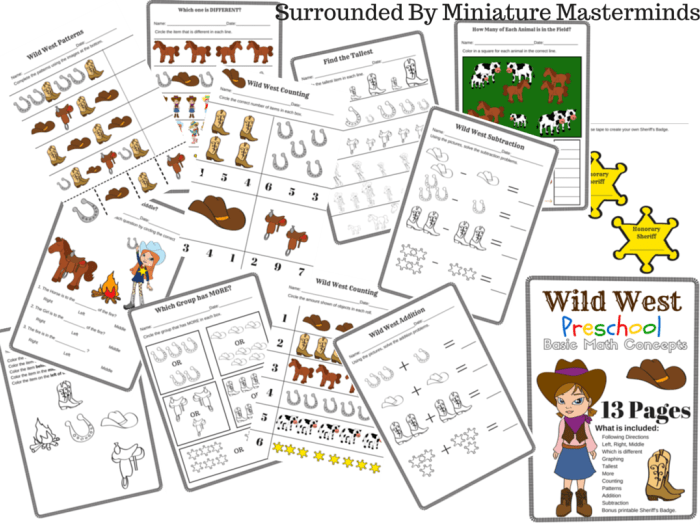 For more Wild West fun check out this free printable writing practice page! This pack is full color and free to use for any daycare, church, school, or home school use.